For all of you shopaholics out there, if there are spots in South Korea to shop at an affordable price, I would gladly recommend the Namdaemun market and the Dongdaemun market. True that malls like Lotte and other store outlets can provide you with great selections of must buy Korean items, but if you really want to buy more, and by more I mean bulky, at affordable price, these two markets located in Seoul, South Korea would be great choices. But if you are torn between these two markets and you need to choose only one, then let this review of mine be your guide to select which market you should shop. Ok, admit it or not, first thing you always consider when you shop, for practicality purposes, is the price. You, or we, always want to get the best item at a very low price. Based on my experience, both Namdaemun and Dongdaemun markets offer shoppers the products that can be bought at a very low price. At Namdaemun, you can buy RTW items like shirts for as low as 3,000 won up to 5,000 won. Dongdaemun however can offer as low as 2,000 won for a shirt or a sweatshirt. Although those items do not have a commercial brand name, quality is still not at stake because everything that made in Korea is of good quality. Since Dongdaemun can offer lower price than the Namdaemun, I will give 1 point to Dongdaemun. A market must be organized well so that shoppers can easily find the items they need to buy. It is essential for customers to go around shopping at ease to save time and effort. Both Dongdaemun and Namdaemun markets are very congested. People swarm to these two places to buy stuffs and it is expected that the crowd is so huge. However, Namdaemun market stands out in terms of arrangement. Unlike Dongdaemun, it is more organized because items are being arranged according to category. There is one side for bags, one area for kitchenwares, another area for RTWs, etc. At Dongdaemun, all items are displayed randomnly. Shopping at Dongdaemun would really take a lot of time because there is no specific area to buy specific items. So I will give 1 point for Namdaemun market for this aspect. What you can see at Namdaemun market, you can see at Dongdaemun. Basically, all items are made in Korea, rest assured that all are of good quality. Although you can also buy rejected items (those with small damages) in these markets, you can choose to buy the good ones. As for the quality, I will give both of them 1 point, it’s a tie. These two places have big difference when it comes to ambiance. Dongdaemun has a laid back environment considering the fact that it is a nature-inspired market while Namdaemun is more commercialized. 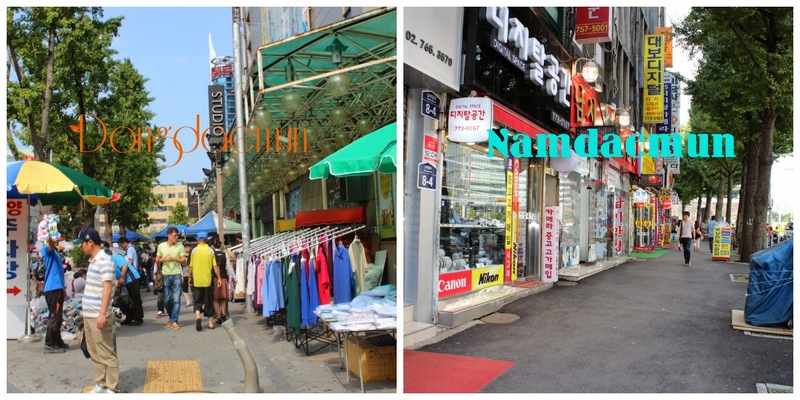 If you are a shopper who wants to see tall and big buildings and a high end environment, then go to Namdaemun. But if you like nature, then Dongdaemun is for you. Personally, I will choose Namdaemun. Look at the subway map of South Korea and you couldn’t find something about Namdaemun there. Only Dongdaemun station is in the subway map. I would say Dongdaemun is more accessible than Namdaemun because of its availability in the map. Take subway line number 4 to Hoehyeon station and take exit #5. Take Subway line number 2 to Dongdaemun History & Culture Park station and take exit #2 or 14. And since Dongdaemun can be easily spotted, 1 point for Dongdaemun. Ok fine, I am just playing safe here. But shopping is based on your taste. You can refer to my review above to help you guide which market is best to shop based on your preferences. The Namdaemun market looks a little more organize to me but it doesn't matter as long as I am able to shop till I drop :-). 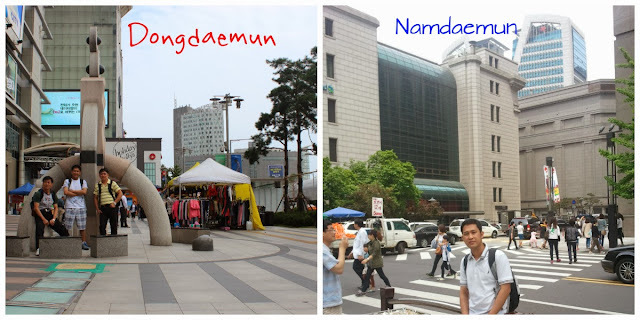 True, Namdaemun is more organize than Dongdaemun. Both market can offer you unlimited shopping experience though. yes, as long as you know how to speak little Korean, you can ask them for a discount. By the photos alone, I can say that Namdaemun is the better place to visit :) Just like Garf, it looks like na mas organized as compared to the other market. yeahboi.... that's perfect for you. I think both places are worth visiting with a different aspect of the area you can see with a trip there. hahaha.. but sometimes, you can get better items at higher price. sure.. they're not far from each other. Thanks for sharing this travel guide. My friend needs to know this because she doesn't know well the places. last time shopping at Namdeamun when single traveler. Next time will go to Dongdaemun. tq for sharing. Thanks for the info! I´m going to one of the markets tonight but couldn't understand if they were different. for rainy days, both markets have sheltered areas to shop. Therefore, it's not really a problem for both.